Every year I like to make a nice stash of homemade gifts for all of those extra special people in our lives that might be forgotten when we pass out gifts – our mailman and UPS/FedEx guys (trust me – they earn it at my house! ), our bus drivers, school janitors, etc. It doesn’t have to be anything fancy but it’s nice to have my kids help out when creating these gifts. I have seen some creative hot cocoa gifts but LOVE LOVE LOVE these Dice Storage Tubes that Oriental Trading sent us to use to fill with hot cocoa, marshmallows, and peppermints for the holidays. The tubes come in a 24 set so you can make just 1 tube into a Hot Cocoa gift or do as I did and package 4 of them together to create 6 separate gifts. NOTE – make sure you wash the tubes and their lids in HOT SOAPY water first as they arrive with a bit of an odor from manufacturing and were not necessarily intended for food usage! 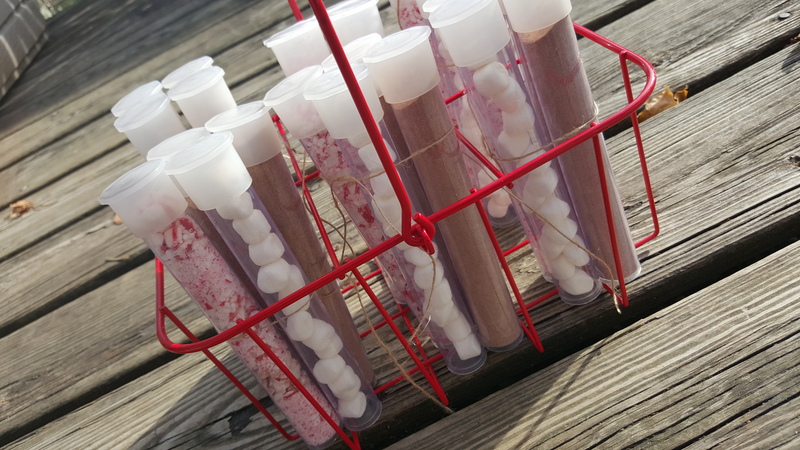 To make the process go quicker I put my empty dice storage tubes inside of a tall glass and spooned in the hot cocoa using a small funnel. 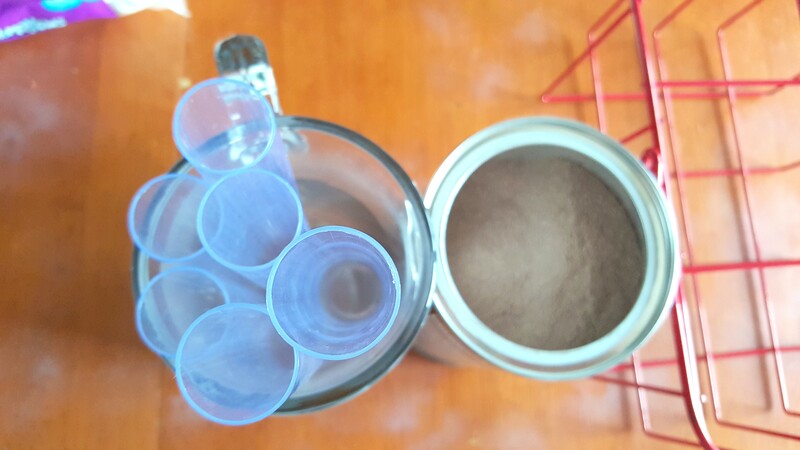 I ended up need one container of hot cocoa plus about 4 spoonfuls out of a second container. 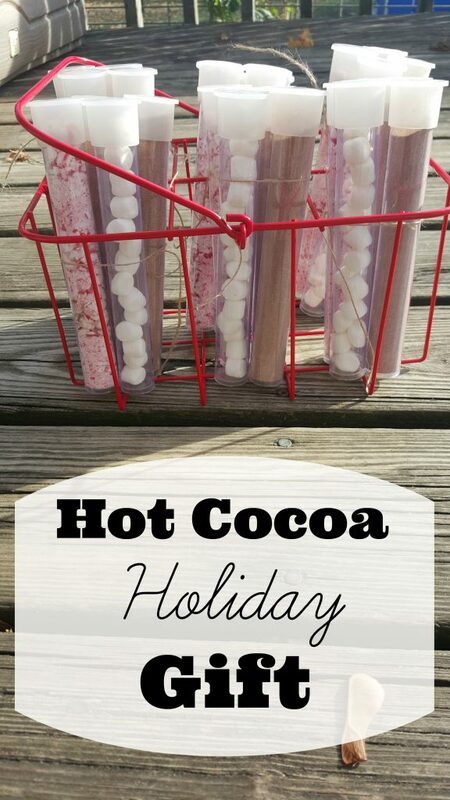 It gave me a total of 12 tubes full of hot cocoa. I enlisted the help of my kids for the peppermints. 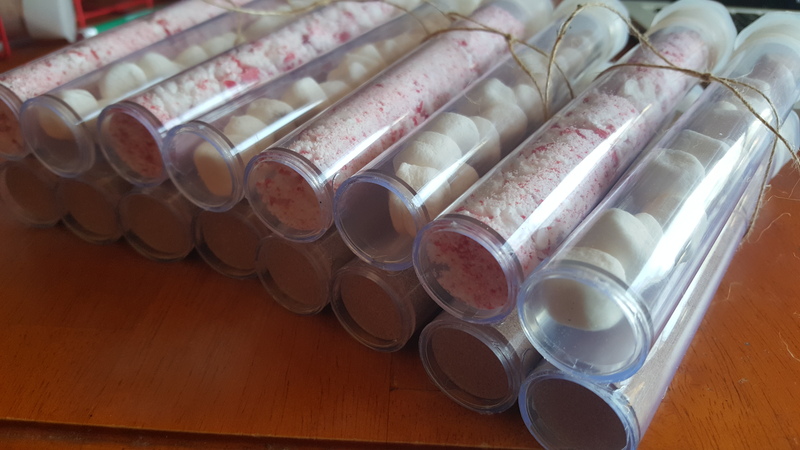 I purchased the SOFT peppermints tub in hopes that it would melt easier – but I think it made them harder to crush! My kids put them in sandwich bags and lightly smacked them with the hammer until they were small enough to pour into the tubes. You’ll need 6 tubes of crushed peppermint. 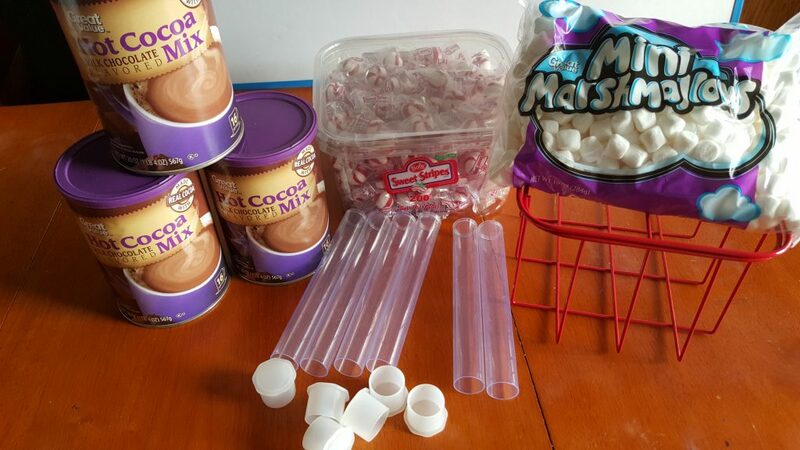 Don’t forget to make 6 tubes of small marshmallows! They were the easiest! SO here comes the tricky part – tying them all together! 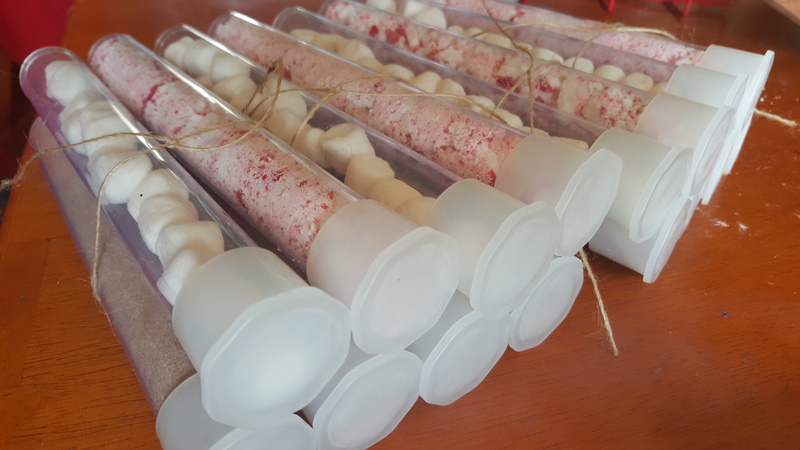 I used Glue Dots at the base of each tube to connect them to the other tubes and then took a piece of twine and tied it around the top of the set for further reinforcement. I wanted it to be able to be easily handled in a 4 set of tubes without falling all over the place. This is all of them lined up together! See how they stack nicely together without slipping off? I first tried just tying them together but quickly realized I needed to use Glue Dots (or a dab of hot glue) at the base to keep them together. Now you’re ready to package them up! You can place them in individual gift bags with a little note or just hand them out as is! Oriental Trading sent me this ADORABLE red wire basket that I put all of my hot cocoa sets in to leave in our teacher’s lounge! It’s technically a basket to hold paint but I will be using it for gifts and craft storage!! 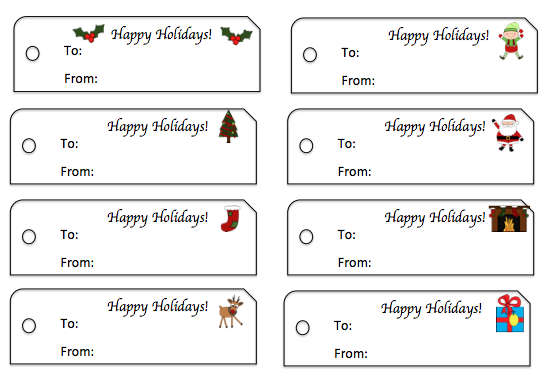 I also created some long gift tags in both color and black/white for you to print if you need them! 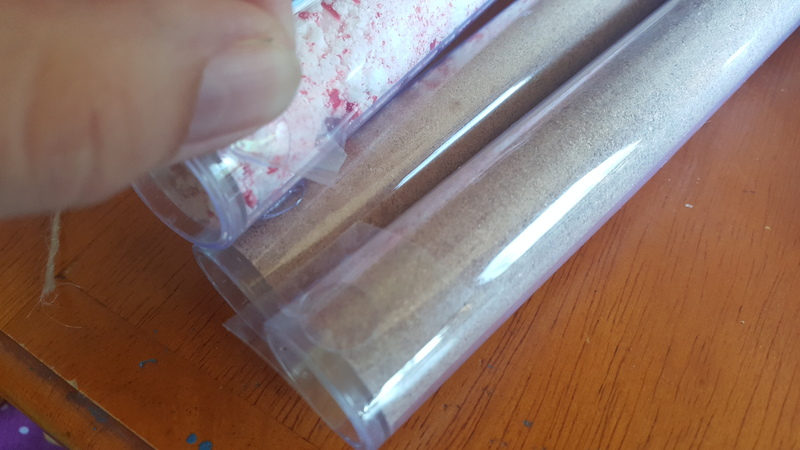 Make sure to order your Storage Tubes at Oriental Trading so they come in time for the holidays!